A Los Angeles firefighter examines the charred remains of a big rig that exploded near the Vincent Thomas Bridge. Photo by Stephen Carr. An explosion and fire involving a big rig near the Vincent Thomas Bridge in San Pedro today damaged some windows at a nearby apartment building, but no one was hurt. 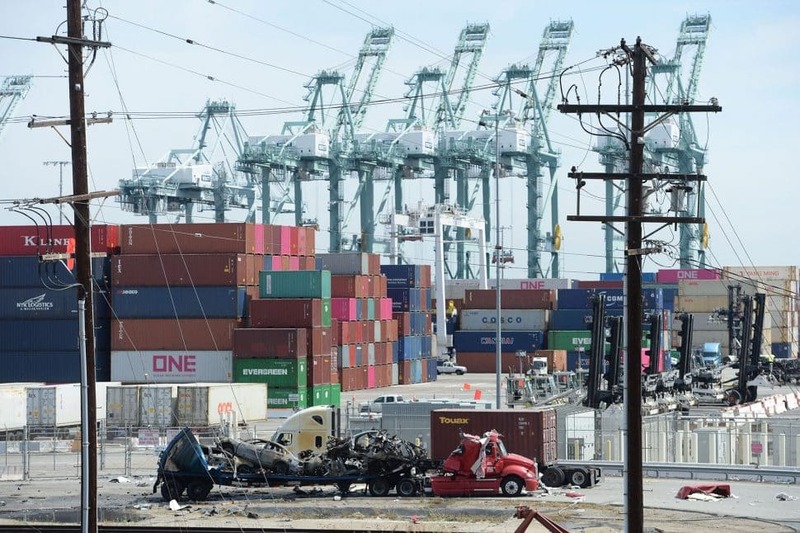 The blast occurred on the grounds of the Los Angeles Port on a roadway outside a cargo terminal, said Phillip Sanfield, director of media relations for the port. Firefighters sent to the 600 block of North Harbor Boulevard about 10 a.m. quickly extinguished the flames, the Los Angeles Fire Department reported. 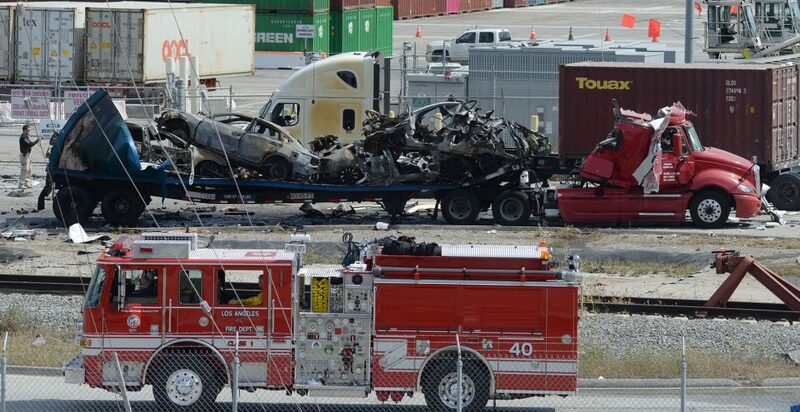 The charred remains of the big rig. Photo by Stephen Carr. In a tweet, the LAPD said the fire appeared to be contained to the back of the truck. Fire officials said it was a big rig with an enclosed trailer that was carrying about four vehicles that were set to be exported. 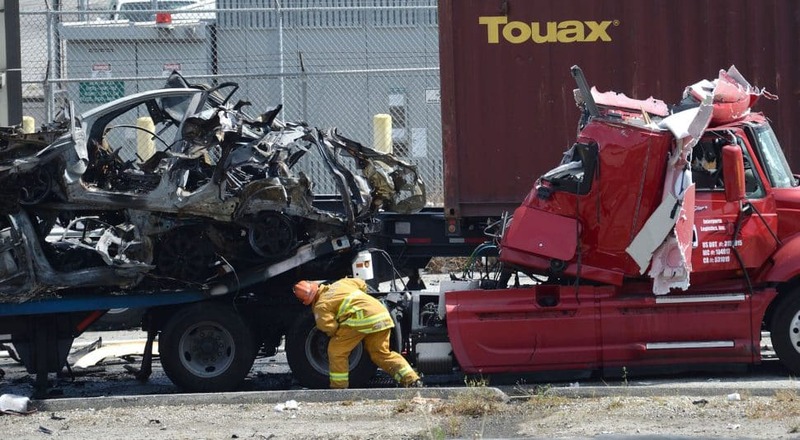 “The male driver of big rig was uninjured and declined hospital transport, as did another adult male driver of different big rig,” the LAFD said in a statement. 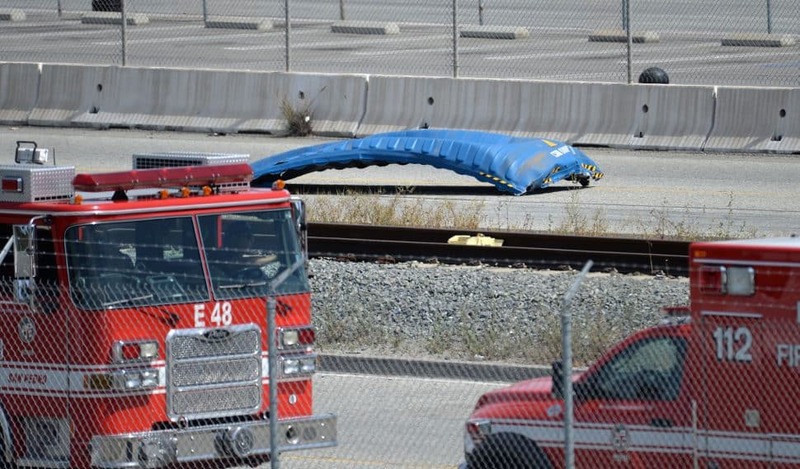 The cause of the explosion was under investigation, but it was being classified as an industrial accident, the LAPD said. The Vincent Thomas Bridge remained open and port operations continued as normal, according to authorities. A Los Angeles firefighter examines the aftermath. Photo by Stephen Carr. A piece of a container left over from the blast. Photo by Stephen Carr. Some shrapnel was thrown from the truck. Photo by Stephen Carr. 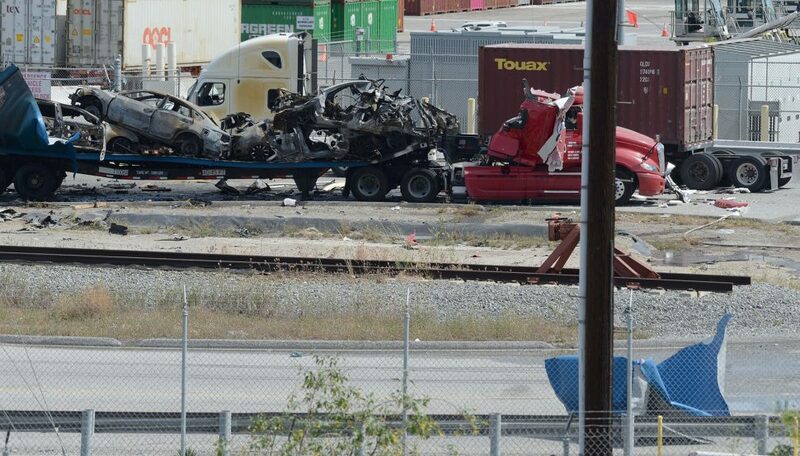 The charred remains of a big rig that exploded at a terminal next to the Vincent Thomas Bridge in San Pedro, Monday, April 15, 2019. Photo by Stephen Carr.